While the lemurs only live on the island of Madagascar, there are at least 11 species of Strepeirhini (or prosimians) living in mainland tropical forests elsewhere in the Old World. They are the lorises of India and Southeast Asia as well as the pottos , angwantibos , and galagos of Africa. All of them are arboreal and omnivorous. However, their hunting is largely limited to easy prey such as insects, eggs, and baby birds. The fact that they are strictly nocturnal has allowed them to largely avoid direct competition with the monkeys and apes, which are all diurnal in the Old World. The lorises and related African species are members of the infraorder Lorisiformes . The lemurs are in the infraorder Lemuriformes . The families of the Lorisiformes can be distinguished based largely on locomotor patterns. The Asian lorises and their close African relatives, the pottos and angwantibos, are slow, deliberate climbers and creepers on forest branches. They are the size of domesticated cats. In contrast, the diminutive 8 inches (20 cm.) long African galagos, or bush babies, are agile hoppers--a single jump can be 6-7 feet (1.8-2.1 meters). Both types of locomotion have advantages for survival. The slow cautious moving lorises and pottos are hard to spot by predators, and the fast moving galagos are hard to catch. Lorises have one other form of defense that makes up for their slow movements. They have unpleasant tasting somewhat poisonous saliva that they lick onto their fur. Mother lorises also lick the fur of their babies which helps to protect them from potential predators. The galagos are the most numerous African primate other than humans, however, few people see them because they live in dense forests and are only active at night. The large rat size tarsier of Southeast Asia is another unusual primate. Their classification is problematical because they have what appears to be a blend of prosimian and monkey traits, but they are genetically somewhat different from both groups of primates. Some researchers consider them to be a third suborder of the Strepsirrhini because of their small size and galago-like behavior. Others emphasize the fact that they lack the wet noses characteristic of lemurs and lorises. Subsequently, they place them in the suborder Haplorrhini along with monkeys, apes, and humans. The second of these two alternatives is used in this tutorial with the understanding that this issue has not yet been adequately resolved. Today, the tarsiers' range is mostly limited to the southern Philippines, Borneo, and the Celebes Islands to the east of Borneo. 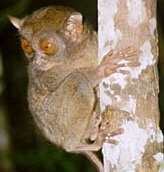 The 3-7 surviving tarsier species have heavy dependence on vision and hearing but reduced ability to smell. Unlike lemurs and lorises, tarsiers lack a long snout and a rhinarium. Their ears and eyes are extraordinarily large for their heads. They produce ultrasounds to communicate with each other. These sounds are beyond the range of human hearing. Adding to their already odd appearance, tarsiers can rotate their heads more than 180�, like some owls. They need to do this because their eye muscles apparently are not capable of moving their enormous eyes very far from side to side. They have long hairless tails, except for tufts on the end, like kangaroo rats. They have elongated hind feet and legs, like galagos, which give them the ability to leap nearly 10 feet (3 meters) in a single jump. This provides an advantage in hunting insects and in avoiding predators. They are strictly nocturnal and carnivorous. They are usually found in the lower branches of trees and on the ground nearby where they find crickets and other insects to eat. They spend most of their lives alone except for mothers and their babies. Let's take a moment to once again think about the framework of primate classification. Carefully study the table below... Remember that there are two major primate suborders. The Simiformes (or anthropoids) will be the subject of the remainder of this tutorial.